A regional daily newspaper has launched a campaign urging councils to stop hiding behind “outdated” rules and allow reporters to Tweet from meetings. The Right to Tweet campaign, set up by the Daily Post in North Wales, follows a spate of instances where local authorities have imposed Twitter bans. While many councils do allow Tweeting to take place and some even stream meetings live online, an increasing number are opting to outlaw the practice. Reporters at the Louth Leader and Boston Standard have both been hit with bans in the past week while the Daily Post itself was barred banned from using Twitter at meetings of Wrexham County Borough Council earlier this month. In a blog post, Daily Post editor Alison Gow questioned why some councils are demanding reporters request to Tweet at each meeting – especially on the occasions they are then refused permission – when automatic permission exists in UK courtrooms. In 2011, the Lord Chief Justice ruled that journalists should be allowed to update their followers from courts across England and Wales without having to seek the prior permission of the judge. Said Alison: “I don’t know why some councils embrace opportunities for transparency and others shy away from it. The subsequent fallout is never edifying – at best, it means the kind of nonsense the Daily Post is trying to negotiate a path through. Alison went on: “I don’t seek out Twitter spats but I do feel strongly that if reporters and the public can use mobile devices to transmit information from court, there is no reason why they should seek permission to do so from public meetings. The Daily Post is not the only paper to suffer at the hands of strict Twitter rules. Louth Town Council in Lincolnshire sparked a row last week after banning journalists from live-Tweeting public meetings, claiming reporters may make mistakes or take comments out of context. Leaders ruled that the immediacy of such reports meant that Tweets may not be “thought through” as carefully as a full printed story. The decision came after Louth Leader reporter Sam Kinnaird requested an amendment to the authority’s standing orders – only to be knocked back when just two members of the 16-strong council voted in his favour. “It is something I wanted to explore as we have seen from other meetings that they do generate interest,” Sam told HTFP. “There was a little support from councillors but in the end only two of them voted in favour of it. The concern was that things would be taken out of context, and reports wouldn’t be thought through as much as a story written afterwards would be. “It seems very strange when you are now automatically allowed to Tweet from court, and the district council allows Tweeting from meetings. You are allowed to report anything that is said at a meeting anyway. Reporters at the Boston Standard were also banned from providing live Twitter updates at a meeting of the full Boston Borough Council last week. The borough authority said it currently only permits people to use Twitter during cabinet meetings and that its constitution would have to be changed to allow the social media site to be used to provide live updates from other meeetings. A spokesman for the authority told the paper that a date has yet to be set to look at changing the constitution, but that the Mayor believes the use of Twitter is a matter that should wait until that discussion. I agree. If people want to know what’s going on go to the meeting. It was never done before the advent of Twitter. It just promotes short-term antipathy before all the facts are out. Love Twitter, but in this case it is serving no one as there is no need whatsoever to receive a live but vicarious account of a council meeting. There’s nothing that can’t be learned after the event that was tweeted during it. 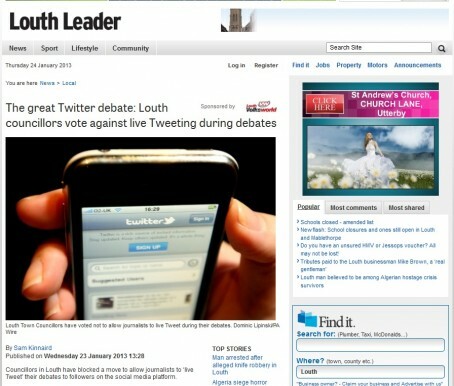 I wonder how many of the Louth Leader’s readers would be avidly following the town council meeting on twitter? I’m all for newspapers tweeting from meetings – especially the opposition. It never ceases to raise a smile when you see one of your rivals madly trying to manufacture 140 word gems on every cough and spit from a meeting – and miss the two or three leads which actually emerged during the debate. In the north-west, some council press officers tweet the proceedings themselves, which is similarly entertaining. If reporters are required to tweet during council meetings, why should residents then buy a daily paper to read about the decisions taken? Then publishers and editors wonder why their circulations continue to fall! The point is, there is no real reason NOT to allow reporters to Tweet from meetings. Everything said, decided, and argued about is available to the public anyway and it’s a highly effective way to engage new readers in issues affecting their local communities, which they may otherwise not be aware of. And Chris Youett – to claim that readers can be satisfied by a few 140 word Tweets is not only untrue, but it misses the point by a country mile. It is more likely to pique someone’s interest and encourage them to fork out the 50p (or whatever the cover price is) to find out the full story the next day. Tweeting local council meetings seems to be the final horror that became almost inevitable after CNN’s invention of rolling news in the first Gulf War. Reporters trying desperately to transmit an urgent message based on Cllr Wibble’s views on recycling targets is as tragic as it’s funny. 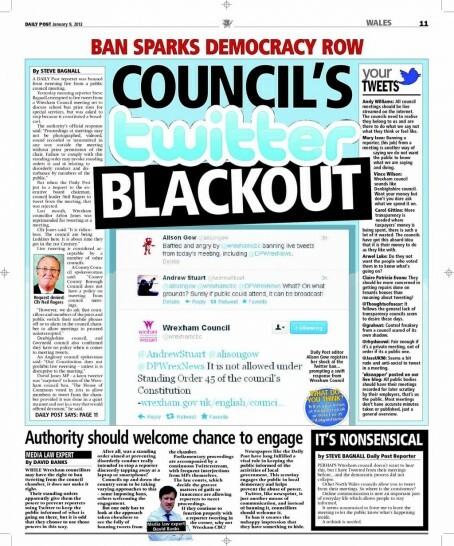 The ban on Twitter by councils is more about controlling the message. Councils are employing more an more officers in “comms” roles – for comms think spin doctors – to control what the electorate see and what the electorate are told. The immediacy of Twitter and its uncontrollability is what worries public sector comms officers. When they try to embrace it they can be as embarrassing as an AmDram actor would be on a Hollywood set. When the message you receive bears no relationship to what is actually happening that can only be bad. I for one would join any campaign to overturn this ludicrous rule as I see it blocks the right to the freedom of the press and free speech. Overturn this Colonel Blimp Rule now. PS any right thinking “independent” would surely get votes by using this as a plank of their manifesto in the local elections in May.